On Saturday at the National Cathedral in D.C., Joe Lieberman spoke about his and John McCain’s Jerusalem dream; which is also a dream of Palestinian refugees. Former senator Joe Lieberman’s eulogy for his friend and colleague Senator John McCain, recounted many tales depicting McCain as a friend, politician, and a moral man. Lieberman spoke about John McCain as “a source of hope and inspiration for oppressed people throughout the world, as it was a source of security for allied countries that share our values” in particular Jerusalem. Then I remembered I first quoted that quote because of a Palestinian Muslim 1948 refugee, whose life inspired my first book, an historical fictional in which everything is true and almost everything actually happened. Mary woke at dawn and re-entered the living room for the first time since she had said goodnight the night before. She was not surprised to see Khaled sprawled out in his recliner or Riad at peace on the sofa. But she was dismayed to see Art curled in fetal position on the black and white checkered tile at the front door. She gently stepped over him into the red and white kitchen as the morning sun broke through the garden window. 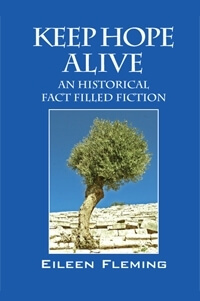 The sun illuminated the cherry-blonde slab stump of an ancient olive tree that had been hewn into a kitchen table and received as a wedding gift from family and friends, who lived in Khaled’s hometown, the village of Majd Al Krum, in Upper Galilee. Even on the most frigid morning, Mary felt warmed by the high-gloss patina of the tabletop, but held more dear the signatures and marks from the entire town etched underneath. Mary silently performed the morning ritual of brewing the first of many pots of Turkish coffee for the day, gratefully inhaled the piquant aroma, and then quickly exited up the back staircase to the bedrooms to wake her daughter for school. When Mary returned to her kitchen after escorting Ahmeena to her third grade classroom, she was not surprised to find Khaled and Riad at the table, downing a second pot of the Turkish brew. Mary marveled at how his gleaming pate radiated the sun’s rejection through the garden window that showcased a pendulous purple wisteria and birdbath, where blue jays had immediately gathered to eat the seed she had just put out. At that moment, Art stumbled into the room, banging his shoulder against the wall and hip into the butcher-block counter. “Oiy! Sylvia is going to fry me! I thought I’d be back at her sister’s by noon, but that bad news about Martin Luther King, Jr., hit us all like a left to the liver! I thought last night would be only good reminiscing, but reality intruded. Hmm, Thanks, Mary, I need this brew.” He nodded and gratefully downed the pungent coffee that Mary had just set before him. “Just toast, Mary, my love,” Khaled whimpered weakly. “Same for me.” Riad beamed, and Mary thought how grateful she was to know him. Mary suppressed a smile as she turned to retrieve it, when the unmistakable seven knock’s of Ahmad was heard at the front door…. Khaled erupted. “I wonder if Israeli Prime Minister Levi Eshkol ever read Micah. I read that when his generals told him that the IDF was the greatest army since King David, he became ecstatic! I cannot understand why the American government is ignoring the situation in my homeland, when, in 1956, the US demanded Israel withdraw from the Sinai Desert back to the international border after only three months. The Six Day War was a year ago, and no such demands were made. “They have turned a blind eye to the destruction of Palestinian towns, and I cannot believe America has not stood up to the Israelis. Not a word of condemnation about the massive building projects in the West Bank, Sinai, Eastern Jerusalem, and the Golan Heights! Not a word that Palestinians are still living in refugee camps, and their homes and olive groves have been plowed over! Art sighed deeply and offered, “You are right, Riad; when will it be enough? The Torah teaches that everyone is a part of God and created in the divine image. We can even agree with Jesus that the greatest command is that we love God with our whole hearts, souls, minds, and strength. I suppose, if everyone did that, it would be a perfect world…. THIS POST HAS BEEN READ 43344 TIMES SO FAR. THANK YOU!